Biography: Where did Jefferson Davis grow up? 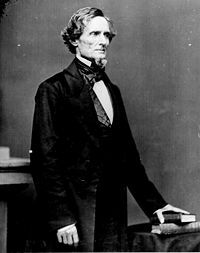 Jefferson Davis was born in a log cabin on June 3, 1808 in Kentucky. He was his parents' tenth child. When he was two years old his family moved to Mississippi. Jefferson grew up in Mississippi where his father owned a small farm. Jefferson had a good childhood where his best friend was his sister Polly who was two years older than him. He learned how to fish, shoot, ride horses, and work on a farm. He attended both local schools as well as boarding schools away from home. When Jefferson was 16 years old, his father Samuel died of malaria. Jefferson was attending Transylvania University at the time and studying to become a lawyer. After graduating from Transylvania, Jefferson's brother helped him to get accepted into the West Point Military Academy. In 1824, Davis graduated from West Point and began his military career. He served in the army until 1835, mostly working on the frontier where he was involved in some small skirmishes with Native Americans. In 1835 he fell in love and married Sarah Knox Taylor, the daughter of his commanding officer, and future president, Zachary Taylor. Zachary did not approve of the marriage and Davis ended up resigning from the military and moving Sarah to Mississippi. Unfortunately, Sarah died a few months later from malaria. After spending several years working on his plantation, Davis began his political career. In 1845, he was elected to the US House of Representatives. He became well known for his powerful speeches and strong beliefs in states' rights. When the Mexican-American War broke out in 1846, Davis resigned his seat in Congress to return to the military. He once again served under General Zachary Taylor. Davis became famous for his leadership skills in battle during the war. In 1847 Davis was appointed to fill an open Senate seat by the governor of Mississippi. He served on the US Senate until 1851 and then became the US Secretary of War under President Franklin Pierce in 1853. After Pierce lost the re-election, Davis once again was elected Senator in 1857. On January 9, 1861 the state of Mississippi seceded from the Union. Davis resigned from his position as US Senator and returned to his home in Mississippi. On February 9, 1861 the Confederate Constitutional Convention in Montgomery, Alabama voted to make Davis the President of the Confederate States. Davis took the job as he considered it his duty even though he was personally against secession and would have rather served as a general in the army. Initially Davis had hoped that the North would let the South secede in peace, but he soon learned that Abraham Lincoln was not going to let the South secede peacefully. When Lincoln did not turn over Fort Sumter to the Confederacy,Davis authorized the Confederate army to attack, marking the start of the Civil War. Davis appointed many of his fellow cadets from West Point to lead the Confederate armies including Robert E. Lee to lead the Army of Virginia. Although the South saw some success, eventually the larger population and wealth of the Union began to win out. The economy in the South became strangled by the Union's blockades and Confederate money became nearly worthless. There was little Davis could do. Davis attempted to gather forces and fight on after Robert E. Lee surrendered at Appomattox on April 9, 1865. However, he found little support. The South was done fighting. Davis was captured on May 10, 1865 in Georgia. He went to prison for two years at Fort Monroe in Virginia. After getting out of prison, Davis traveled and worked a couple of jobs including running an insurance company. He eventually settled down and wrote a book about the Confederacy called the Rise and Fall of the Confederate Government. He was named Jefferson after the 3rd president Thomas Jefferson. His family called him Jeff while growing up. His middle name was Finis, which means "final" in Latin. His parents named him this because they expected him to be their final child. Abraham Lincoln was also born in a log cabin in Kentucky about eight months later and 100 miles from where Davis was born. The people of Mississippi asked Davis to represent them in the US Senate a third time after the Civil War, but he was not allowed to serve as he refused to take an oath to the Union and was not legally a citizen of the United States.